This is no surprise! 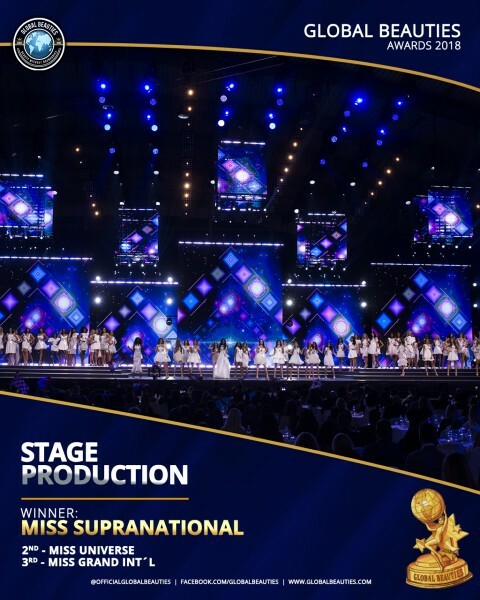 If there´s something that Miss Supranational has achieved in its 10 first years of life, was to raise the bar when in comes to Grand Slam pageants stage productions! Year after year, it puts together state-pf-the-art stages, which mesmerize us all. The stage, the lights and the led images come together with perfection, truly being at the Academy Awards level, with no exaggeration. In 2018 Miss Supra nailed it again, when celebrating its 10th edition. Miss Universe came 2nd, proving that simple can be actually great, impressing our pageant experts judges and fans around the world with its beautiful crossed runways. As Sally-Ann Fawcett put it, “Despite dropping from the heights of the Trump glitz and glamour era, MU can't be bettered for camera work and production values, which added value to its stage production”. Miss Grand International built a whole pageant structure from ground zero, doing once again a fabulous job and taking the bronze medal in this category. Miss World´s stage was quite interesting, falling into to a “love or hate it” category, as you can see based on how our judges voted (two of them put it in first place, while others voted for it in last or 2nd last). There was no “mid term”, pushing it out of the podium, in 4th place. By a landslide, with 9 out of 10 judges placing it last, Miss International finished in e very distant 5th place with its extremely simple and outdated stage. Being hosted in Japan, the land of high technology, Miss International has the means to improve it, something we hope to see in the near future. Medel - W S U G ! Maes - S W U G !